Simply Friends :) - A mummy's inane blabberings..
Jean, Joan & I were interviewed last September for a feature in the Feb's issue of Simply Her Magazine. 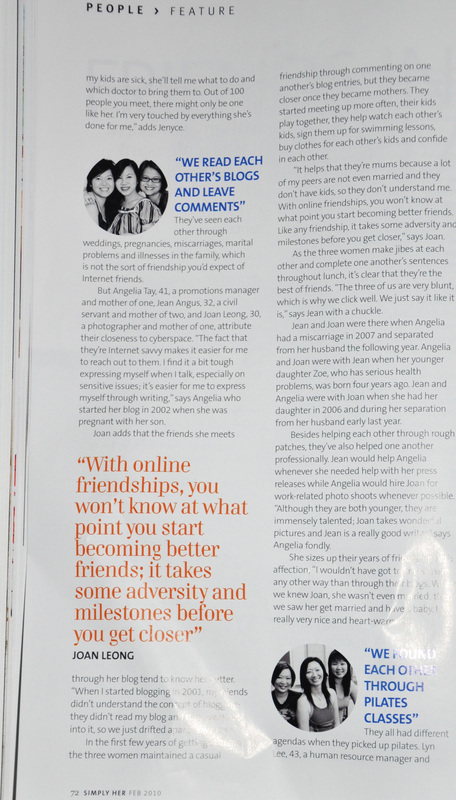 We were 3 of 10 women which Justina spoke to for this feature which was on the different avenues through which women find/meet their friends and in our case, it was via blogging. 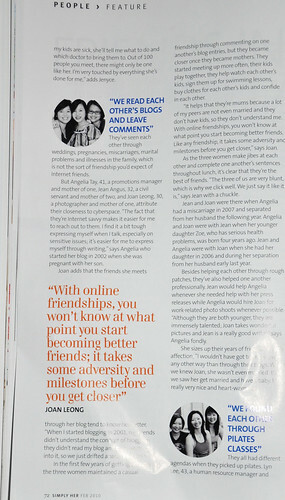 Janice & Angela were also featured and you can read theirs at Janice's blog. I thought the part on the eggbeater was really hilarious!! you girls look great in that last shot! i like joan's top! This is great! And what great pictures! The friends I've made through blogging have really seen me through my ups and downs! yeah..it is interesting how friendships have developed through the reading of each other's blogs.. These are great pictures of you guys! yeah, they are great. Joan took them! you know, lj was the facebook of today during its hey day...Thats how i got to know all the rest( AJ, Ben, jiawei,etc) and you of course! Ah... memories! the internet is such a fab tool for new friendships! it is amazing how blogging/facebook has changed the way we make friends. i'm closer to some of the people i've met online than i am to friends i went to school with. and yes, that picture is awesome! Wah, those are very nice photos of you guys! Why not? Internet friends whom you meet and hang out with in real life are real friends too what! haha dont need to get lah..just browse at the bookstore can already! aww I like the photos! Esp the 2nd one! the three of you look lovely! and i think it's touching that you've seen each other through so much... it's not cham! thanks! joan took the pic so gotta thank her for it. and yeah, cant believe that in a mere6+ years we have known each other, so much has happened in our lives..
all 3 of you look gorgeous! thanks woman..hoi, when we makaning/meeting up?